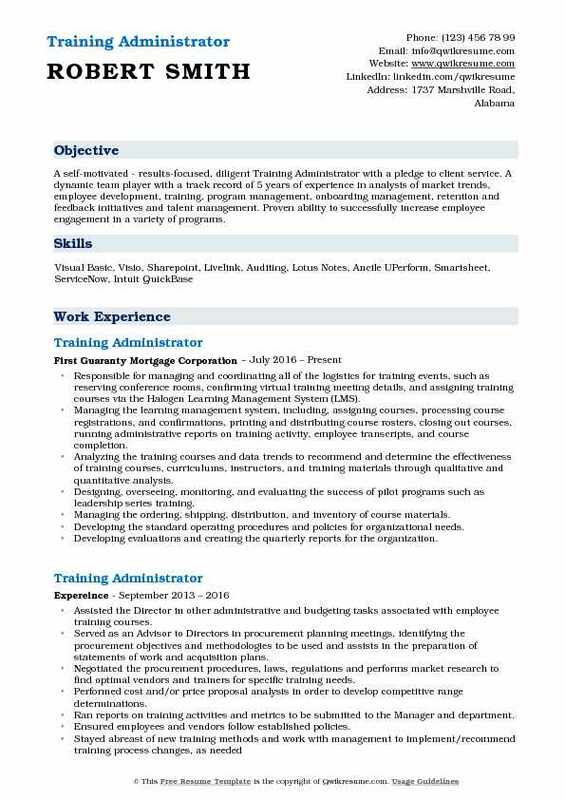 A Training Administrator is hired to provide support for various training functions. 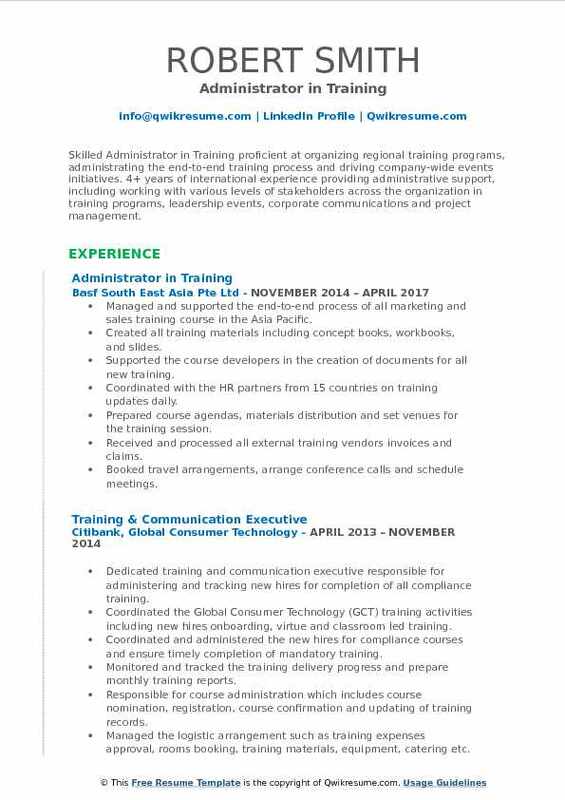 The job description entails communicating with vendors and participants and assisting in developing effective training programs. 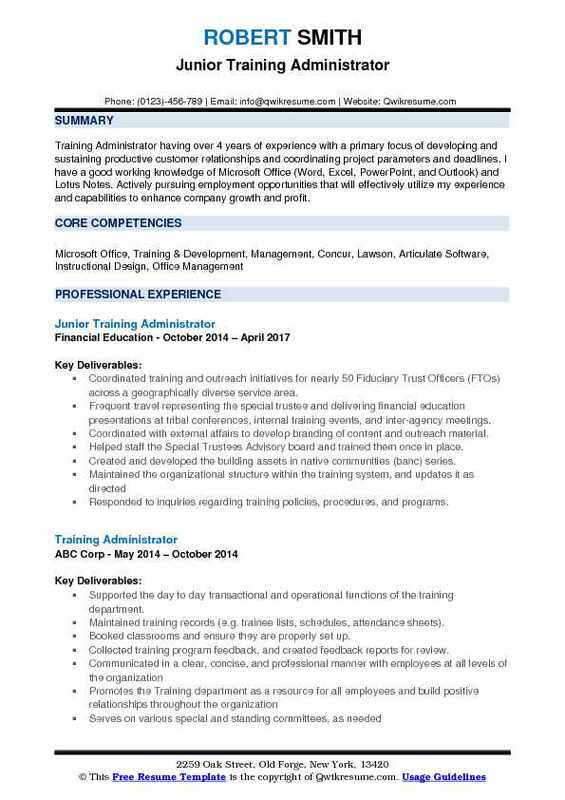 The key responsibilities undertaken and depicted in the Training Administrator Resume include – creating and implementing training programs, maintaining training record, preparing and disseminating materials, handling accounts receivable and invoices, resolving issues, submitting training reports to upper management, recommending improvements for new programs, and ensuring vendors and employees follow the established policies. As a Training Administrator, these skills are expected of you – proven work experience, project management skills, knowledge of office procedures and billing, MS Office proficiency, good working knowledge of LMS and databases, and outstanding communication skills. While some employers want only a postsecondary education with relevant experience, many demand a College Degree in Psychology or Business or related field. Summary : Self-motivated, personable and passionate Training Administrator with experience of 25 years in managing a large number of diverse employees with success. 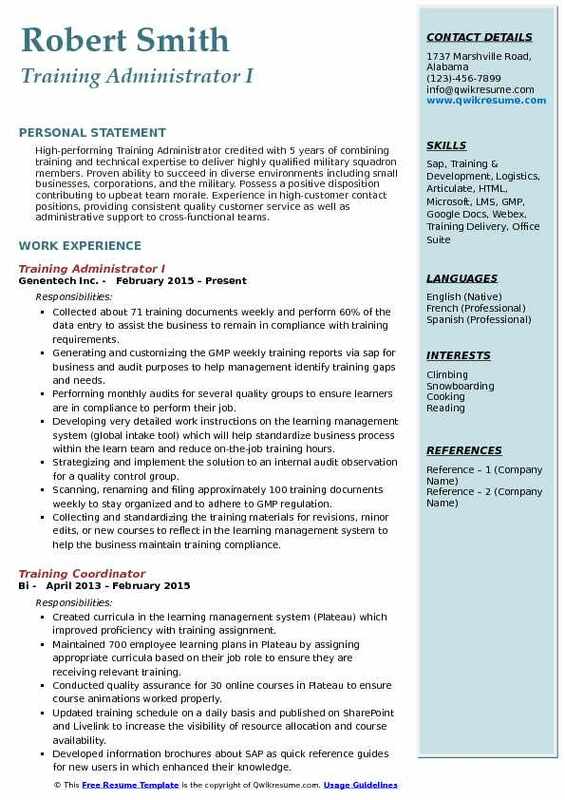 Adept at self-study and communicating professionally. Flexible, able to multi-task and can easily learn new skills. Thrive in deadline-driven environments. Excellent team-building skills and proven success in client development. Supervised production and administrative teams of 10-250 personnel in leadership development. Qualified 20 trainees as small boat captains and 18 as craft engineers resulting in continuous organizational mission readiness and the accomplishment of joint and combined ship to shore operations. Chaired employee career development boards to enhance personal and professional growth as well as disciplinary review boards to decide and implement corrective action. Conducted specific training and education programs to increase diversity and placement of employees according to qualifications and skill sets, creating cross-functional team members. Selected as the commands combined federal campaign representative, accomplishing 100% contact to 700+ members and raising $50k to various charitable organizations. Managed and directed 40 executive departmental personnel, ensuring all daily activities were conducted. Managed a team of career counselors in the execution of 115 re-enlistments, 84 extension contracts, 31 retirements/separations, and the submission of 450 career management system database entries in support of sailors career endeavors. Performed tactical deployment of 57 personnel and 17 harbor security boats. Objective : Training Administrator having over 4 years of experience with a primary focus of developing and sustaining productive customer relationships and coordinating project parameters and deadlines. I have a good working knowledge of Microsoft Office (Word, Excel, PowerPoint, and Outlook) and Lotus Notes. 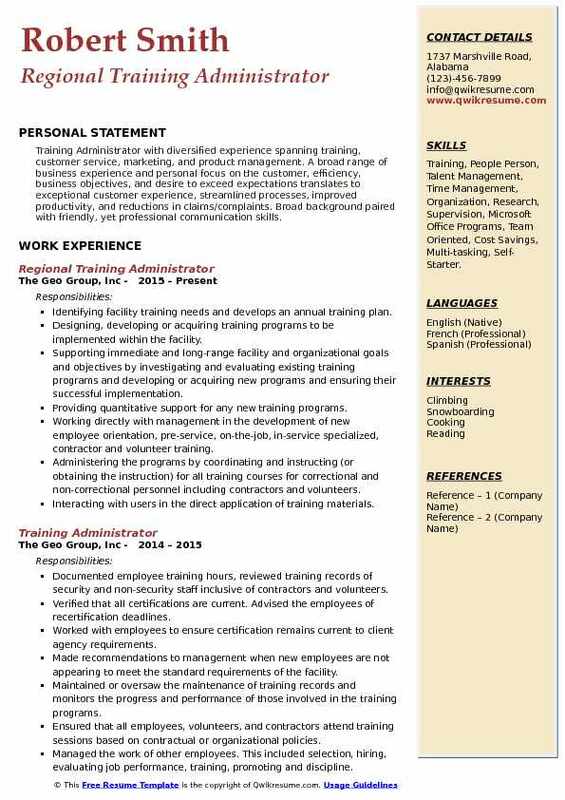 Actively pursuing employment opportunities that will effectively utilize my experience and capabilities to enhance company growth and profit. Coordinated training and outreach initiatives for nearly 50 Fiduciary Trust Officers (FTOs) across a geographically diverse service area. Frequent travel representing the special trustee and delivering financial education presentations at tribal conferences, internal training events, and inter-agency meetings. Coordinated with external affairs to develop branding of content and outreach material. Helped staff the Special Trustees Advisory board and trained them once in place. Created and developed the building assets in native communities (banc) series. Responded to inquiries regarding training policies, procedures, and programs. Created and provided training reports to Directors, Managers, and Supervisors upon request or as scheduled. Assisted in monitoring professional development services to ensure that performance outcomes are achieved within agency objectives. Summary : Experienced, polished and professional presenter and a Senior Training Administrator with 9 years of experience. Thorough and articulate training curriculum developer. Successful and energetic Program Manager and Coordinator for various government programs. Designed and developed numerous training programs on various topics. Developed curriculum and presented at numerous national level training conferences in numerous states. Identified the group and individual training needs and designed an organizational training strategy. Researched, designed, developed, coordinated, communicated, delivered, and supported the training and organizational development with a focus on individuals professional and leadership development. Wrote, solicited for, edited, and published the division-wide monthly newsletter. Facilitated meetings as a non-bias team member, to assist employees with opposing viewpoints in coming to a collective agreement which will benefit the entire division, as well as its mission. Facilitated brainstorming sessions for employees within the division. Developed individual training plans. Designed and expanded training and development programs based on continual needs assessments. Planned, coordinated, and executed the delivery of training conducted by external consultants and presenters. Coordinated with the licensing authorities to ensure that appropriate continuing education credits are applied to training events and coordinated support for audits of CPE. Objective : Skilled Administrator in Training proficient at organizing regional training programs, administrating the end-to-end training process and driving company-wide events initiatives. 4+ years of international experience providing administrative support, including working with various levels of stakeholders across the organization in training programs, leadership events, corporate communications and project management. Managed and supported the end-to-end process of all marketing and sales training course in the Asia Pacific. Created all training materials including concept books, workbooks, and slides. Supported the course developers in the creation of documents for all new training. Coordinated with the HR partners from 15 countries on training updates daily. Prepared course agendas, materials distribution and set venues for the training session. Received and processed all external training vendors invoices and claims. Booked travel arrangements, arrange conference calls and schedule meetings. Reviewed A/P training numbers and plans for the year, identified the training gaps and refine processes. Maintained tracking of training database, calendar, evaluations, materials and supplies. Planned and executed the onsite the train-the-trainer program in Shanghai and Malaysia. Plan and execute teambuilding session with all participating the Asia Pacific trainers. Designed, conceptualized and launched the sales efficiency online survey for all sales. Headline : High-performing Training Administrator credited with 5 years of combining training and technical expertise to deliver highly qualified military squadron members. Proven ability to succeed in diverse environments including small businesses, corporations, and the military. Possess a positive disposition contributing to upbeat team morale. Experience in high-customer contact positions, providing consistent quality customer service as well as administrative support to cross-functional teams. Collected about 71 training documents weekly and perform 60% of the data entry to assist the business to remain in compliance with training requirements. Generating and customizing the GMP weekly training reports via sap for business and audit purposes to help management identify training gaps and needs. Performing monthly audits for several quality groups to ensure learners are in compliance to perform their job. Developing very detailed work instructions on the learning management system (global intake tool) which will help standardize business process within the learn team and reduce on-the-job training hours. Strategizing and implement the solution to an internal audit observation for a quality control group. Scanning, renaming and filing approximately 100 training documents weekly to stay organized and to adhere to GMP regulation. Collecting and standardizing the training materials for revisions, minor edits, or new courses to reflect in the learning management system to help the business maintain training compliance. Headline : A self-motivated - results-focused, diligent Training Administrator with a pledge to client service. A dynamic team player with a track record of 5 years of experience in analysis of market trends, employee development, training, program management, onboarding management, retention and feedback initiatives and talent management. Proven ability to successfully increase employee engagement in a variety of programs. Responsible for managing and coordinating all of the logistics for training events, such as reserving conference rooms, confirming virtual training meeting details, and assigning training courses via the Halogen Learning Management System (LMS). Managing the learning management system, including, assigning courses, processing course registrations, and confirmations, printing and distributing course rosters, closing out courses, running administrative reports on training activity, employee transcripts, and course completion. Analyzing the training courses and data trends to recommend and determine the effectiveness of training courses, curriculums, instructors, and training materials through qualitative and quantitative analysis. Designing, overseeing, monitoring, and evaluating the success of pilot programs such as leadership series training. Managing the ordering, shipping, distribution, and inventory of course materials. Developing the standard operating procedures and policies for organizational needs. Developing evaluations and creating the quarterly reports for the organization. Summary : A self-motivated Training Administrator with over 13 years of experience providing thorough and skillful support to department managers. Exceptional interpersonal skills and have dealt with a diversity of professionals and staff members to meet client/customers and company needs. Excels at prioritizing in a fast-paced environment, completing multiple projects and handling administrative functions simultaneously while exhibiting professionalism and sound judgment. Skills : Oracle, ExpertScan, Saba & Access LMS Databases, Adobe Acrobat, Microsoft Office, Open Office, WebEx, Saba Centra And Savvy Internet. Responsible for facilitating discussions on process improvements for the BCI web, Elearning modules, scheduled conference rooms, developed agendas, planned meetings, dictated meeting minutes and tracked action items to closure. Entered course descriptions for newly created courses in the eLearning course. Served as the POC for any new course received on the lesson plan form and forward to the TWG. Assisted employees and managers in understanding training requirements. Maintained the training requirements document and ensured accuracy electronic. 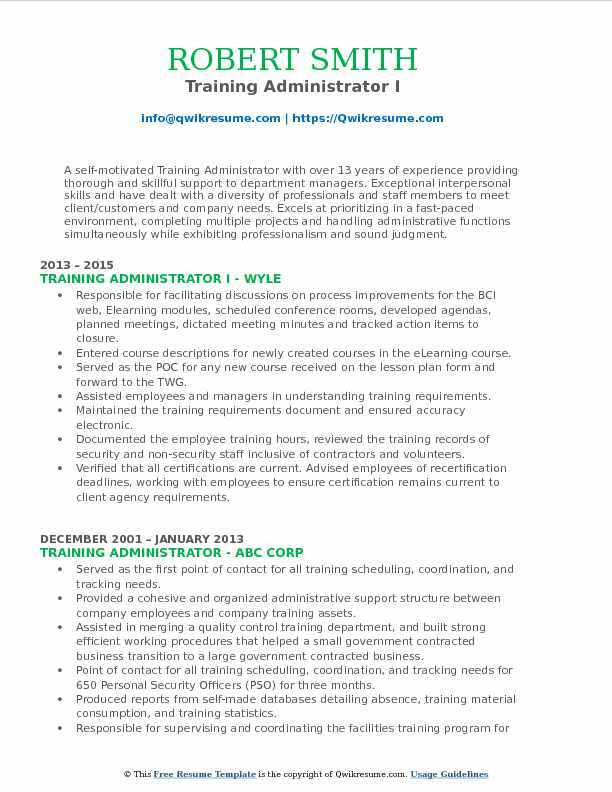 Documented the employee training hours, reviewed the training records of security and non-security staff inclusive of contractors and volunteers. Verified that all certifications are current. Advised employees of recertification deadlines, working with employees to ensure certification remains current to client agency requirements. 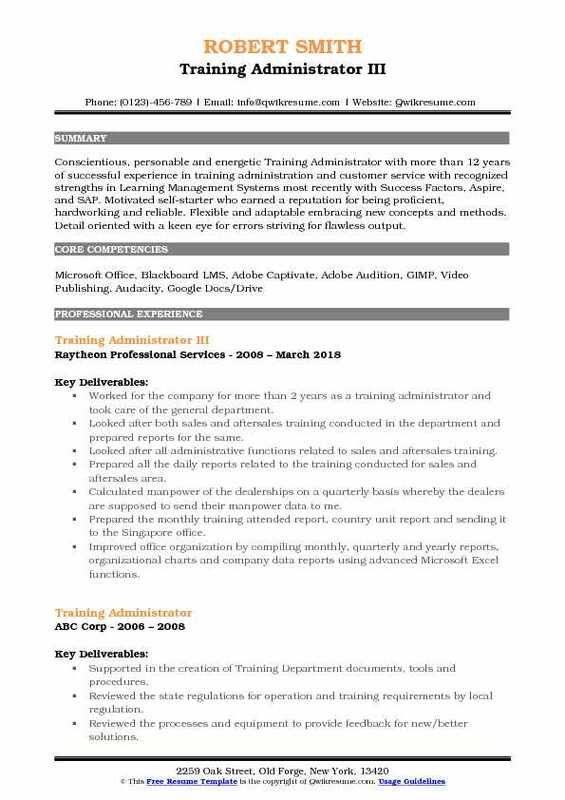 Summary : Conscientious, personable and energetic Training Administrator with more than 12 years of successful experience in training administration and customer service with recognized strengths in Learning Management Systems most recently with Success Factors, Aspire, and SAP. Motivated self-starter who earned a reputation for being proficient, hardworking and reliable. Flexible and adaptable embracing new concepts and methods. Detail oriented with a keen eye for errors striving for flawless output. Worked for the company for more than 2 years as a training administrator and took care of the general department. Looked after both sales and aftersales training conducted in the department and prepared reports for the same. Looked after all administrative functions related to sales and aftersales training. Prepared all the daily reports related to the training conducted for sales and aftersales area. Calculated manpower of the dealerships on a quarterly basis whereby the dealers are supposed to send their manpower data to me. Prepared the monthly training attended report, country unit report and sending it to the Singapore office. Improved office organization by compiling monthly, quarterly and yearly reports, organizational charts and company data reports using advanced Microsoft Excel functions. Created powerpoint presentations that were successfully used for business development. Prepared monthly reports for records, making the reports for various evaluations and insured that all documentation has been received and filed. 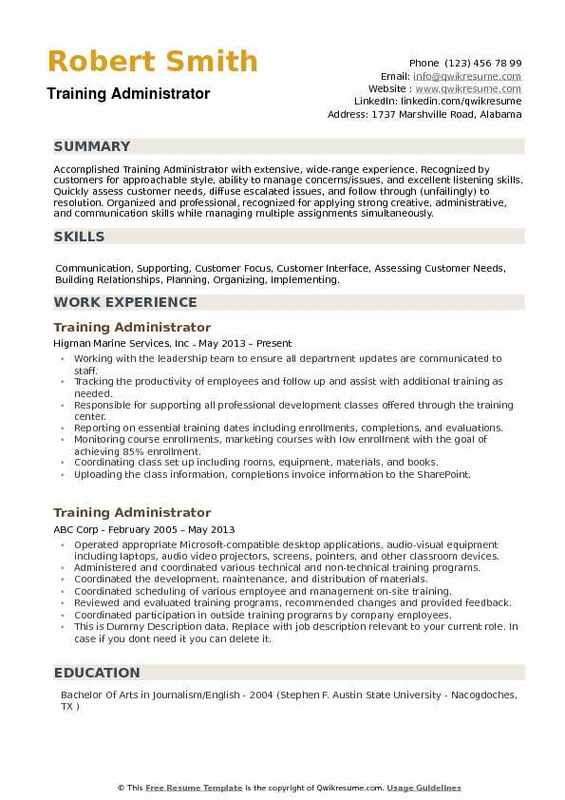 Objective : Training Administrator with diversified experience spanning training, customer service, marketing, and product management. A broad range of business experience and personal focus on the customer, efficiency, business objectives, and desire to exceed expectations translates to exceptional customer experience, streamlined processes, improved productivity, and reductions in claims/complaints. Broad background paired with friendly, yet professional communication skills. 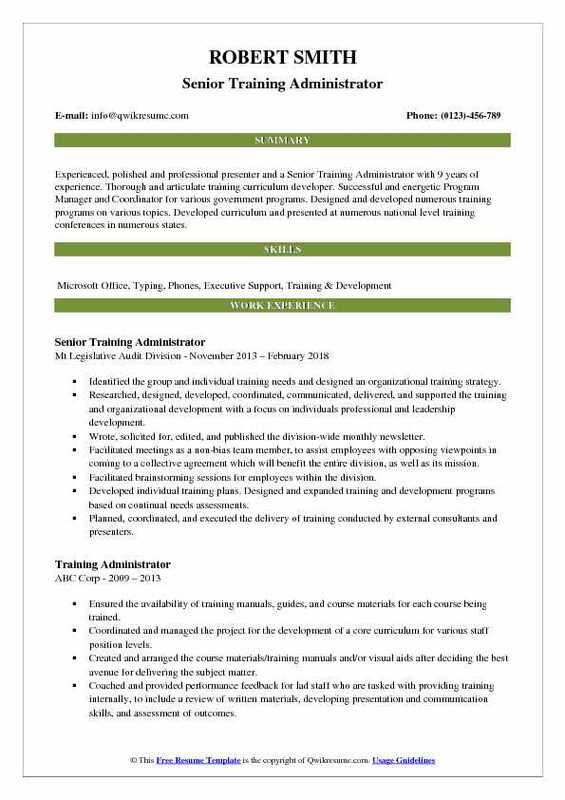 Skills : Training, People Person, Talent Management, Time Management, Organization, Research, Supervision, Microsoft Office Programs, Team Oriented, Cost Savings, Multi-tasking, Self-Starter. Identifying facility training needs and develops an annual training plan. Designing, developing or acquiring training programs to be implemented within the facility. Supporting immediate and long-range facility and organizational goals and objectives by investigating and evaluating existing training programs and developing or acquiring new programs and ensuring their successful implementation. Providing quantitative support for any new training programs. Working directly with management in the development of new employee orientation, pre-service, on-the-job, in-service specialized, contractor and volunteer training. Administering the programs by coordinating and instructing (or obtaining the instruction) for all training courses for correctional and non-correctional personnel including contractors and volunteers. Interacting with users in the direct application of training materials. Providing or facilitating unit orientation classes for volunteers, contractors or other personnel who are not employees of the facility. Managing the workflow and providing trainers with supplemental or support instruction. 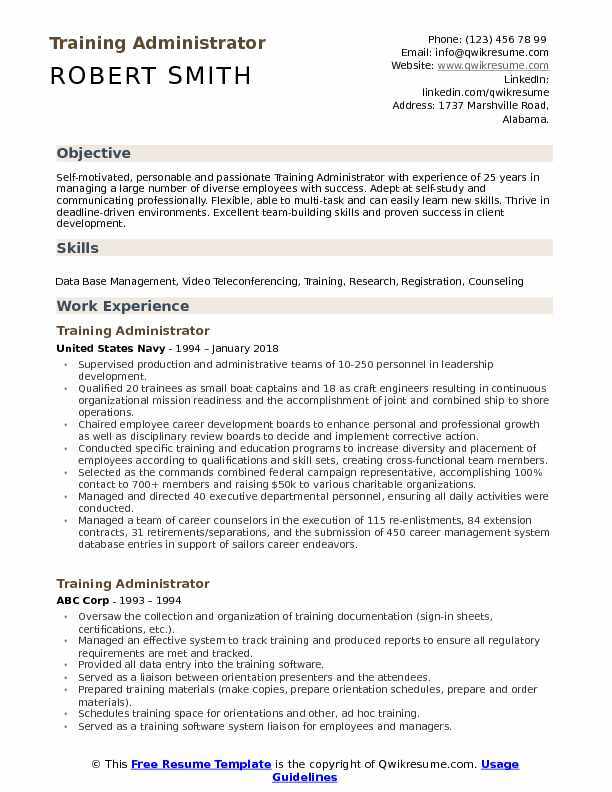 Summary : Accomplished Training Administrator with extensive, wide-range experience. Recognized by customers for approachable style, ability to manage concerns/issues, and excellent listening skills. Quickly assess customer needs, diffuse escalated issues, and follow through (unfailingly) to resolution. Organized and professional, recognized for applying strong creative, administrative, and communication skills while managing multiple assignments simultaneously. Skills : Communication, Supporting, Customer Focus, Customer Interface, Assessing Customer Needs, Building Relationships, Planning, Organizing, Implementing. Working with the leadership team to ensure all department updates are communicated to staff. Tracking the productivity of employees and follow up and assist with additional training as needed. Responsible for supporting all professional development classes offered through the training center. Reporting on essential training dates including enrollments, completions, and evaluations. Monitoring course enrollments, marketing courses with low enrollment with the goal of achieving 85% enrollment. Coordinating class set up including rooms, equipment, materials, and books. Uploading the class information, completions invoice information to the SharePoint. Coordinating functional training classes, reserving rooms, entering and issuing credit upon completion. Coordinating instructor resources, assisting instructors with the preparation of class materials. Answering phones, scheduling conference rooms, assisting walk-in clients.